This recipe is oh-so-savory and oh-so-easy to make. The best part is, you only need one large skillet and a cutting board to get this dinner prepared and ready to serve. 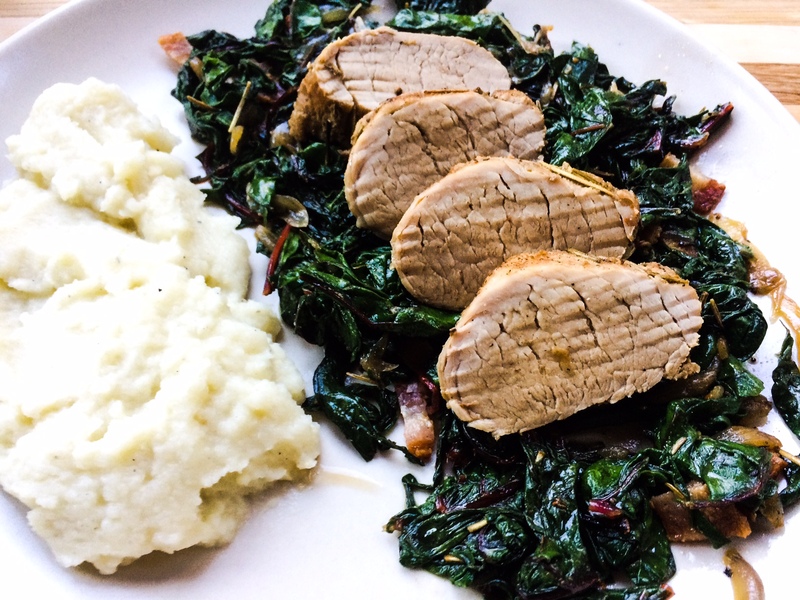 Heritage pork tenderloin combines beautifully with sweet and mild shallots, and beautiful red and green rainbow chard. You can also use swiss chard, collard greens or kale in this recipe and it will be just as delicious and still pack many of the health benefits of rainbow chard. Oh, and did I mention there’s bacon? Yeah, bacon makes an appearance and adds a nice crunch, texture, and flavor to the rainbow chard. 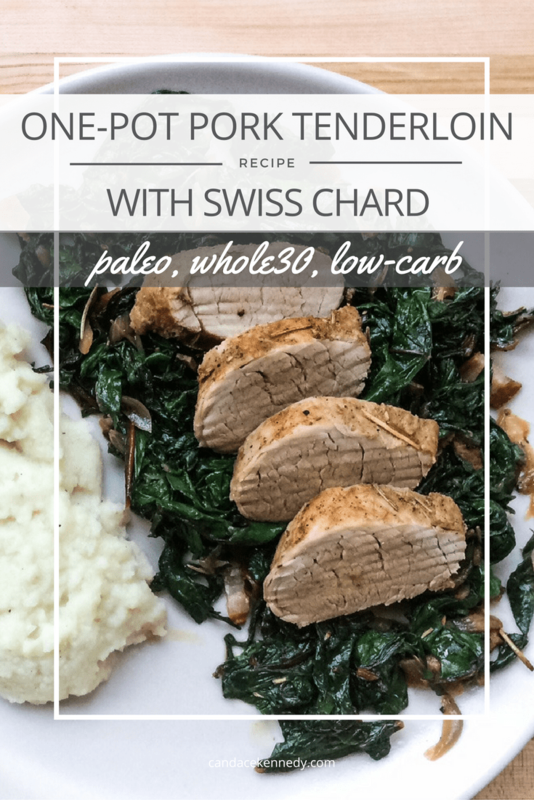 I should also mention this recipe is Paleo, Whole30, and Keto-friendly. Happy eating! Can we talk about pork for a minute here? You may not associate pork with nutritious, healthy food, but I am here to tell you otherwise. Pork tenderloin is an excellent source of protein, of course, but also the mineral, selenium. Selenium is important to your thyroid health and can help regulate your metabolism. It is also a powerful antioxidant that can increase your production of glutathione, your body’s most potent antioxidant that plays a key role in liver detoxification. Talk about some anti-inflammatory action there. You’ll also find a good amount of phosphorus in pork tenderloin, along with b-vitamins (essential to energy production in the form of ATP) and choline. Choline and b-vitamins are both mood-boosting nutrients, as they both support healthy neurotransmitter production. Pork tenderloin is a good source of the amino acid, tryptophan, too. Tryptophan is a precursor to your neurotransmitter, serotonin. Serotonin is involved in your hormone secretion, sleep-wake cycle, motor control, immune function, sensory perception, mood, & appetite. So, you see, lots of good things coming out of this cut of meat. Of course, like most foods, not all pork tenderloin are created equal. Have you ever heard of heritage pork? Heritage pork is from pigs raised humanely, sustainably, and without the use of growth hormones or antibiotics. I don’t know about you, but I can definitely do without meat that’s loaded with growth hormone and unnecessary antibiotics. The nutrient profile of heritage pork is also far superior to CAFO (factory-farmed) pork. Heritage pigs eat a diet similar to what they’d eat in the wild. In the wild, pigs will eat most anything they can find, from grass and roots to nuts and fruit. They have a diverse and nutritionally dense diet. Contrast that to CAFO animals that are fed mostly corn and soy and have a diet very high in inflammatory omega-6 fatty acids. You’re not just what you eat, you are also what you eat ate. More omega-6 in their diet, means more omega-6 in your diet. There’s an awesome article that covers the nutritional divide between CAFO and sustainably farmed animals on PaleoLeap: Not Just the Cows: Pastured Pork and Poultry. Where Can I Find Heritage Pork? So where do you find these nutrient-dense, humanely, and sustainably-raised pork tenderloins? If you have a local butcher you know and trust, that would be the first start. Ask them specifically for heritage pork. If they don’t have it now, they may be able to get it. There’s a great one in Austin called Salt & Thyme. Don’t live in Austin and don’t have a local butcher? There’s an amazing company, US Wellness Meats, that has everything from heritage pork to grass-fed meat to pasture-raised chickens, and more. Their meat, poultry, and seafood are top quality and they ship all over the United States. Yes, heritage pork is more expensive, but the benefits far outweigh the costs. Every time you or I make a purchase, we have a chance to impact our food systems. If you are able, choosing to purchase higher-quality meat is not only a better choice from a nutritional standpoint, it is a better choice for the environment. You are making a more sustainable choice and advocating for the humane treatment of farmed animals. I understand that it may not be feasible for everyone to spend more money on heritage pork, but there are at least better options available at grocery stores than factory-farmed pork. It’s important to be aware that quality matters, not just for your health, but for the sustainability of our food systems. So, if you’re able, please consider quality when you go to purchase meat. Okay, rant over. Now let’s get cooking! Grab a large skillet and put it on the stove over medium-high heat. Add the bacon to the skillet and cook until bacon is nice and crispy. While the bacon is cooking, generously season the pork tenderloin with the rosemary, garlic powder, dried mustard, 1 teaspoon sea salt, and 1/2 teaspoon pepper. When the bacon is finished cooking, remove it from the pan and set it to the side. We’ll use it later. Add the pork tenderloin to the pan and sear on both sides, about 3 minutes on each side. Toss the shallots into the pan and cook for about 4-5 minutes, until the shallots start to get nice and golden. Add the bone broth to the pan and reduce the heat to medium-low. Cover the skillet and cook about 8-11 minutes, depending on how thick the pork tenderloin is. After the pork has finished cooking, remove it from the pan and set it on a cutting board. Let it sit there for 5-10 minutes. While the pork is resting, add the chard to the pan with a dash of salt and pepper (the shallots and liquid will still be in the pan…let those flavors dance!). Cook the chard about 5 minutes over medium heat. Plate your dish! Chop the bacon and mix it with the rainbow chard and shallot. Serve the chard alongside your pork. You can also use some of the liquid left in the pan and spoon it over the pork. This dish goes great with maple-glazed acorn squash (for a little sweet and savory) or cauliflower mash. When the bacon is finished cooking, remove it from the pan and set it to the side. We'll use it later. Add the shallots to the pan and cook for about 4-5 minutes, until the shallots start to get nice and golden. While the pork is resting, add the chard to the pan with a dash of salt and pepper (the shallots and liquid will still be in the pan...let those flavors dance!). Cook the chard about 5 minutes over medium heat.